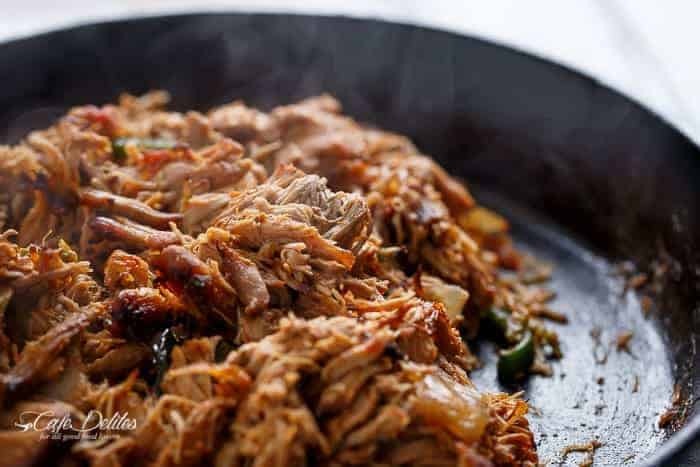 Crispy Slow Cooker Carnitas (Mexican Pulled Pork) Con Ancho Chiles | Poblano Peppers smothered in so much flavour, you won’t be able to put your forks down! Yes, I sound like an infomercial. 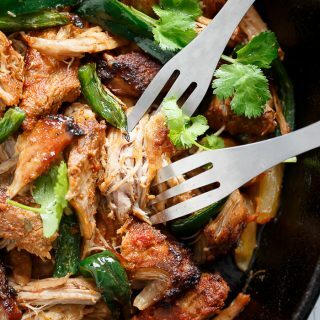 After having tried different types of recipes, this is the most incredible Carnitas recipe we tried! 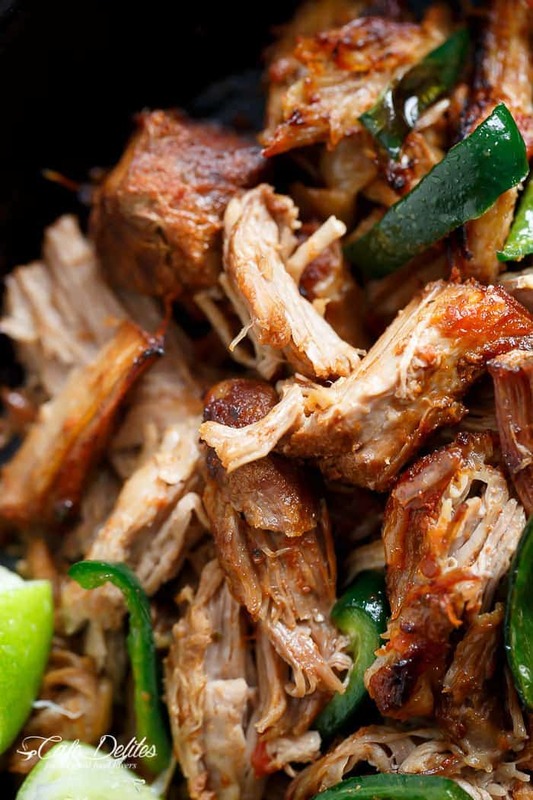 Carnitas literally means ‘little or small meats’. It’s usually taken as a cute way of saying ‘carne’, which in Spanish is meat. So: cute little small meats, I guess is the translation. May sound odd in English, but to those of us native spanish speaking gente (people), it completely makes sense. And sounds delicious. And in this recipe, I’ve included TWO methods to cooking this pulled pork! One is in a slow cooker, and the other is slow cooked in your OVEN! Now, although I’m not Mexican, (being half Colombian and half Uruguayan), the language we all speak is the same. We may have different dialect and few words have different meanings, but there’s ONE thing that unites all latinos…besides music and dancing. And that one thing is food. Comida. Good in both languages. When I saw Poblano Peppers, known as Ancho Chiles in spanish (translated means wide chillies), I KNEW a Mexican-inspired recipe was coming. I felt it in my bones. 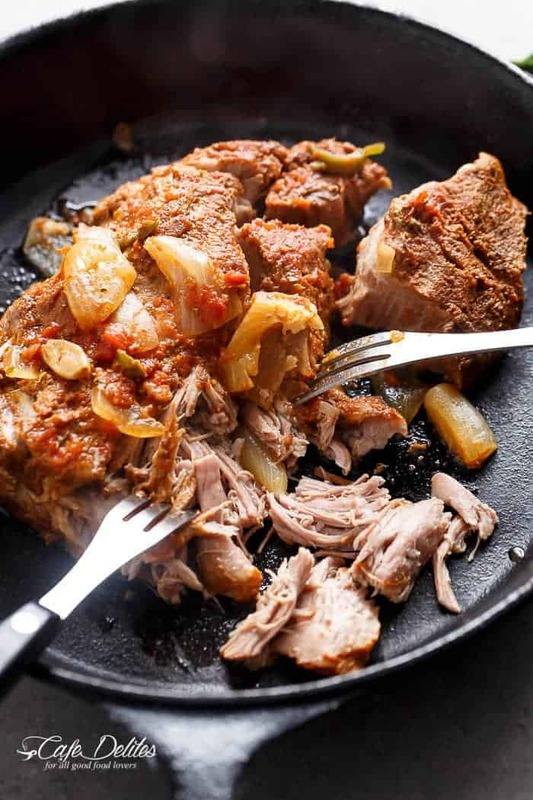 Having tried authentic Carnitas at many food festivals here in Melbourne over the years, and over in L.A when travelling to my original home town, New York, the time came for me to attempt to make a lower fat, but just as delicious version, in my appliance lover — my slow cooker. I say lower fat version, because most Carnitas are made in lard. They’re crispy and tender, and worth every single calorie. BUT. Sometimes, you want the best of flavours without worrying about the new pair of jeans you just bought and fitting into them tommorow. Searching through recipes, a lot of them call for orange juice mixed with lime juice. Well, we tried those recipes. Honestly, I have to say no. Not for us. Not to say others won’t enjoy carnitas in orange juice. We just. Well, we couldn’t do it. Not even the smell was enticing us while they were cooking. They just smelt, and tasted, wrong? You know when things just don’t really go together? Anyway, I threw all of those recipes out the window and settled for my own version, trusting myself to come up with something absolutely incredible rather than copying what everyone else is doing. ¡Oh diosito! The aroma sifting through my kitchen while these were cooking was mouthwatering! I kept peeking through the glass waiting, with my fingers tapping on the kitchen bench, for what I would find inside. And I wasn’t disappointed in the least! 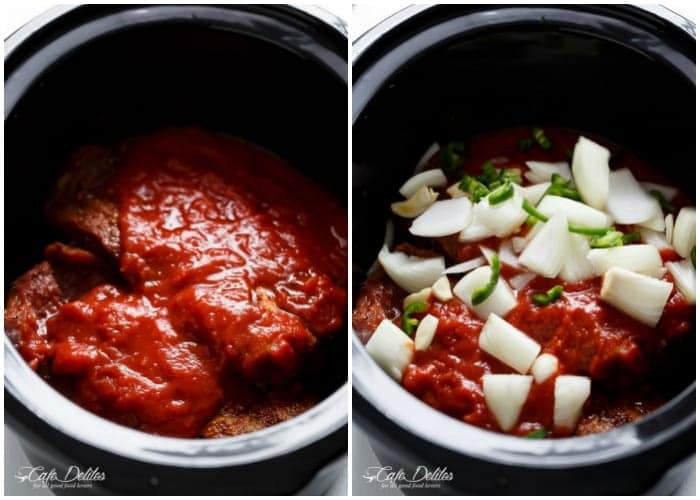 As with other slow cooker recipes, these are extremely easy to make. 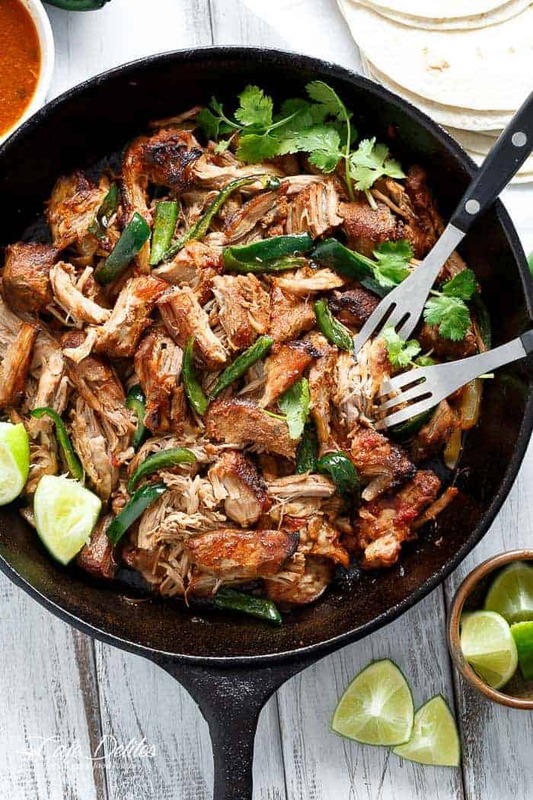 Simply rub the pork in Mexican inspired spices we love so much. Pour in crushed tomatoes. Add in sliced, fresh Jalapeños and garlic with chopped onion…..
And rub it all together for the best marinade you may ever try on pork. After 4 hours on high, or 7-8 hours on low setting, carefully lift the pork out of your cooker pot (I say carefully, because it melts through your spoons and falls apart so deliciously almost before hitting your skillet). 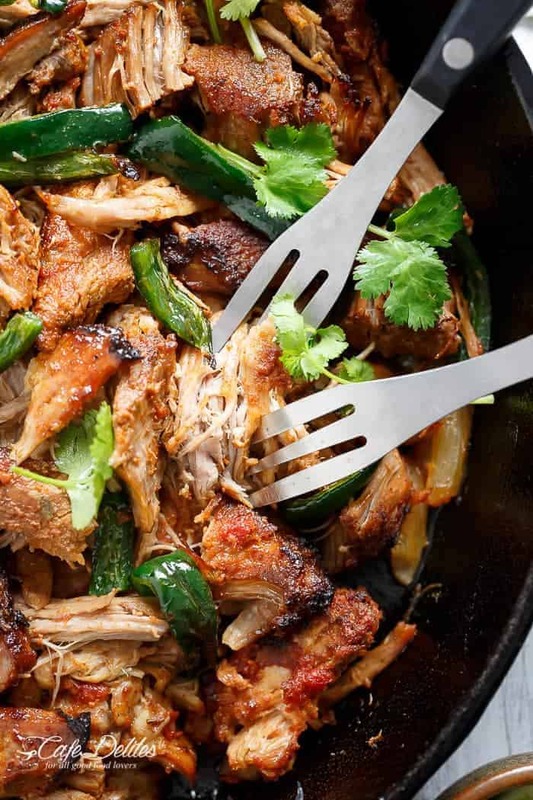 Pull it apart with your forks and you can either fry the Carnitas in a skillet OR place them on an oven tray and broil (or grill) under your oven broiler until they crisp up and became the best tasting Carnitas you’ve ever tried. And if you’ve never tried them? Well, now’s your chance! Steaming hot and super crispy! These can be served in tacos (one of the most popular way of eating them), or burritos. But! I’ll be posting a lower carb version on Monday! Keep your eyes peeled for that! In the meantime, I’ll leave you with crispy, tender, falling apart pork smothered in so much flavour, you won’t be able to put your forks down! Crispy, tender, falling apart pork smothered in so much flavour, you won't be able to put your forks down! Rinse and dry the pork shoulder with paper towel. 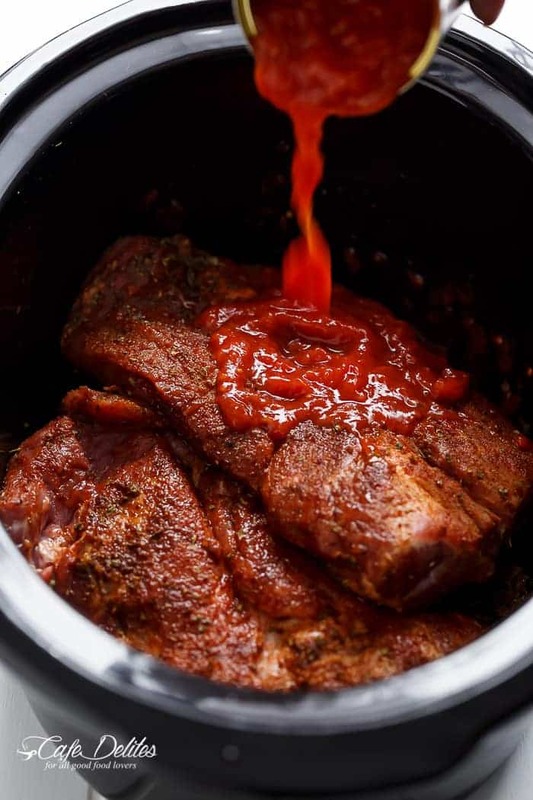 Place the pork in slow cooker bowl and add in the oil, oregano, cumin, paprika, salt, pepper and brown sugar on the pork. Rub seasoning all over pork; top with the onion, garlic, and jalapeno. Add in the tomatoes and squeeze the lime juices over the pork. Mix everything together until well combined. Cover and cook on low for 8 to 10 hours or on high 4 to 5 hours. 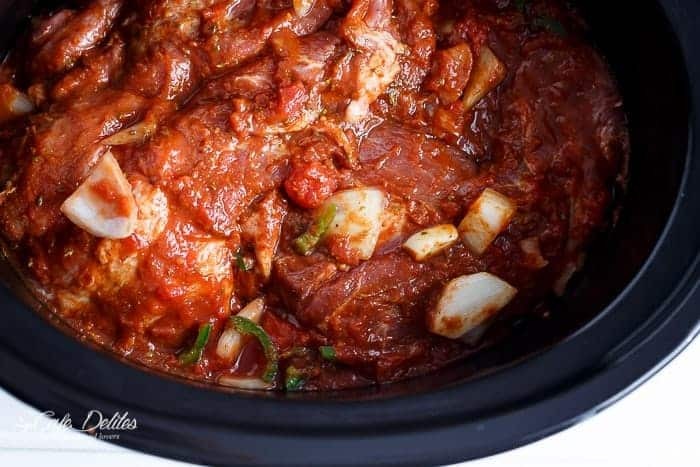 Once the meat is fork tender and falling apart, remove from slow cooker and allow to cool slightly before pulling apart with 2 forks. 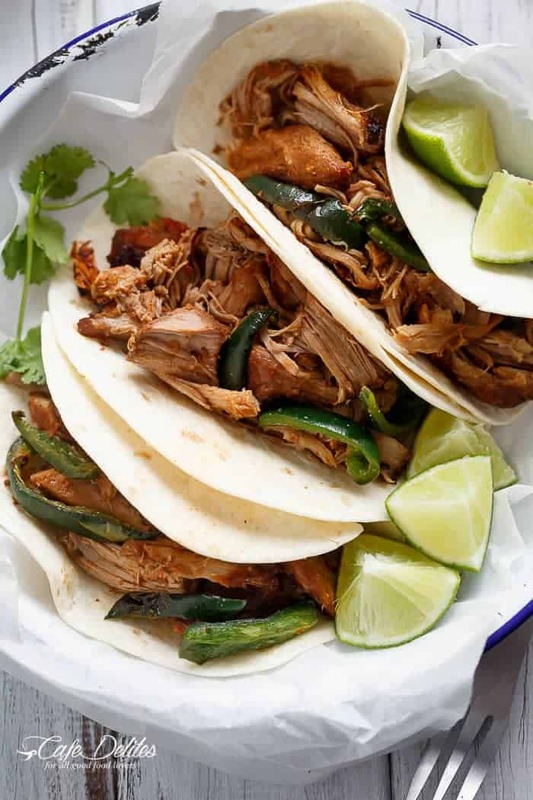 Place the carnitas (shredded meat) onto a baking tray; drizzle with sauce from the slow cooker; add the ancho chiles (poblano peppers) and allow to grill/broil in a preheated oven on medium-high settings until golden and crispy. 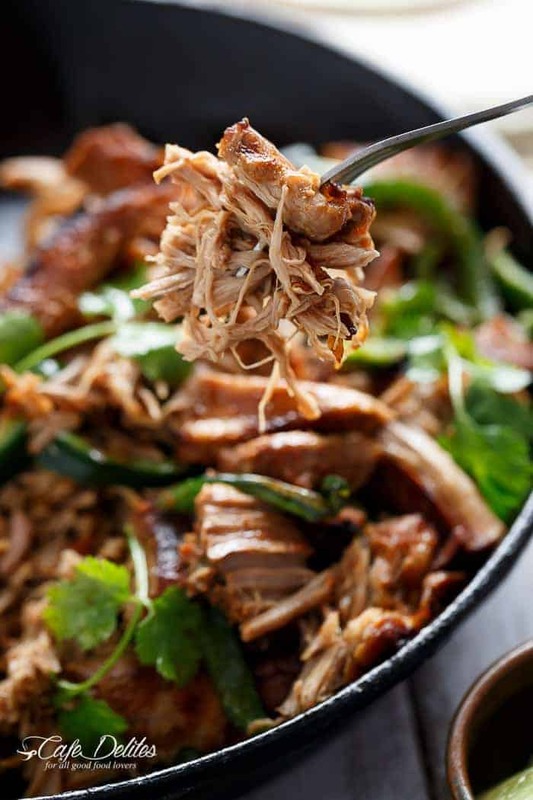 Alternatively, place shredded pork into a skillet and fry until crispy with the chile slices over medium-high heat. Preheat oven to 120°C | 250°F. Place an oven rack in the lower-middle part of your oven. Coat pork in spices and sauces as above. Put the pork in a roasting pan and cover pan tightly with foil. Bake for about 6-8 hours, or until falling apart, basting it in it's own juices after three hours or so. Add in the ancho pepper strips during the last hour of roasting (if including). This was excellent! My family loved it! One addition that I made was to fry a spicy cheese blend until fully melted, then cook a raw flour tortilla on it. 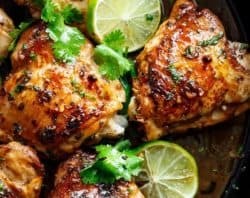 Next, I’m going to try your chili lime chicken salad! This is the lower fat version since most of the meats cooked like this are cooked in lard. This recipe is not like that. Hope that you enjoy it! The recipe isn’t posted any more! Can someone please share it? I made these in the slow cooker today, paired with home made tortillas. They look great, taste amazing, and ingredients were cheap. Thanks for the great recipe! This will become a regular dish at my house. Sounds as if this could be a nice family meal. Can this be made in a pressure cooker instead of a slow cooker? Yes, you are welcome to try it with a pressure cooker. I have not tried it yet. Let me know how it turns out! what is the nutritional facts of this dish? By way of an “FYI,” If you go to a place that sells Chilies, the Poblano’s are green and usually quite mild. (They can be hotter, it is always a good idea to do a taste test with a “small” piece! 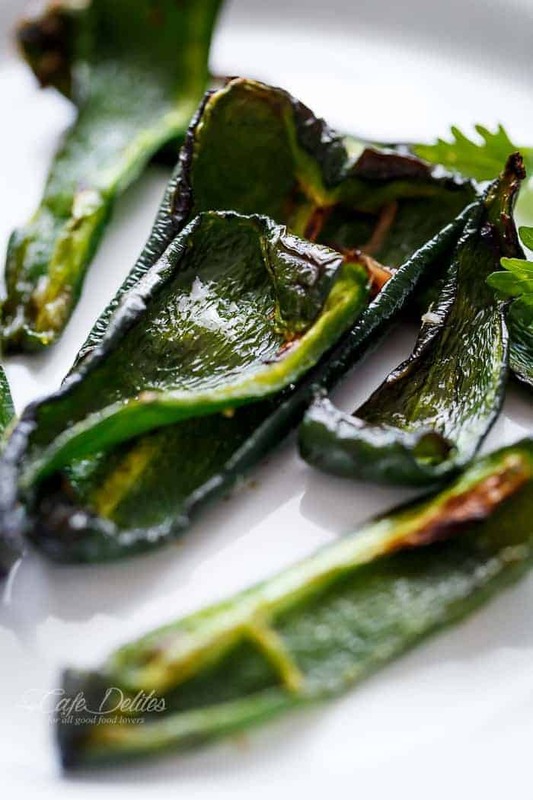 The Ancho Chili peppers are the dried version of the Ripened or fully matured Poblano chilies. They will be very shriveled, look black and are a whole lot hotter than the green poblanos! order something listing ancho chilies as an ingredient…be prepared for hot! (Pretty much the same as something with Chipotle as an ingredient!) & What makes the heat levels of chilies so variable, is very hot weather and lack of water, as in growing conditions! 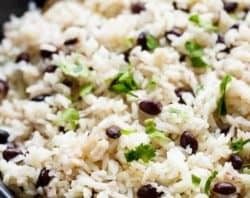 Hi Karina, this recipe looks amazing and I really want to try it but we don’t eat pork. 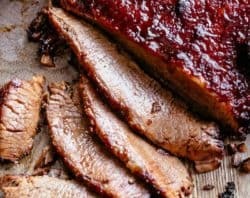 Is there another cut of meat I can substitute? Thank you so much. First of all Thank you so much for your awesome recipes! I make them all the time. My question is: can I use bbq sauce instead of the can tomatoes? This was AHHHHHMAZING to say the least. My hubby could not stop eating them. Definitely a favorite for sure!! 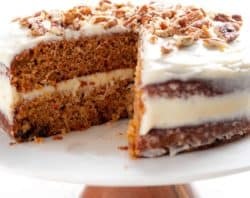 Thank you so much for this recipe!! Since I do not have a slow cooker, do you suppose I can use a multicooker instead? Put it in the “stew” regime for about 3 hrs? Amazing! My family is Mexican and we usually make fried beef tacos per a family recipe. We wanted to mix it up and this is so good! I’ve made this recipe twice now, and it’s been my only foray into cooking pork other than a pork tenderloin. Man girl, you nailed it on this recipe! Thanks for an AMAZING and easy way to prepare for multiple dinners and then some! Thanks Karina for the nice recipe for pork carnitas. Made this today for Sunday dinner and it was out of this world delicious!! 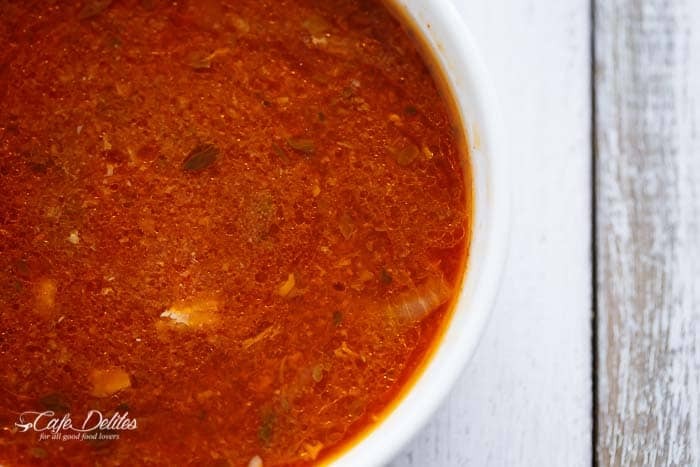 The only thing I did was use 1/2 cup of canned diced tomatoes ( all I had) then added chicken broth to make up the difference….I used smoked paprika and cooked a 6.4 lb roast in the crock pot on night for 2 hours then low for 2.75 hours. The meat fell off the bone and it was super moist. Definitely will make again!! Thank you!! Cannot. Stop. Drooling. These look incredible! And I love the option of slow cooking in the oven- what a great idea! Now I’m hungry! It looks so yummy, definitely on my list! This looks absolutely amazing! My mouth may or may not be drooling on my desk right now. I was just wondering if you think I would be able to get away with using a tenderloin rather than the shoulder because that is what I have in my freezer right now. Hi Andrea! Your comment made me laugh so hard, so thank you! I hope your desk is okay 😉 I wouldn’t suggest tenderloin as it can dry out. You could try it, but I would make it with the shoulder. 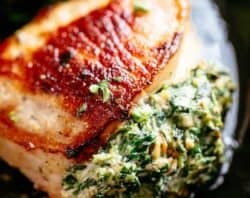 Shoulder has m ore fat which makes this recipe super moist and juicy. I hope that helps? Delicious! Tried these tonight, my first experience with carnitas, and I gotta say they were EXCELLENT. Even my mother (who ate with us, and usually hates new things) loved them. These carnitas look fantastic! Thanks for sharing! You’re very welcome Heather! I hope you do and equally hope you enjoy it! 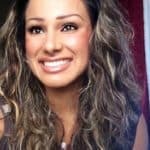 Love your blog and recipies! 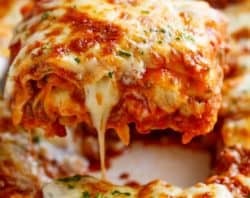 I would love it even more if there was an instruction to make this without a slow cooker or a le cruset… Do you think it is possible to make this in the oven with silverfoil?? Hugs from Camilla in Denmark!